Stockport County have signed teenage Reading striker Nicholas Bignall on loan until January. The 19-year-old has signed in time to play in the Hatters' Johnstone's Paint Trophy tie at Crewe on Tuesday. Bignall played in both of Reading's Carling Cup ties this season, scoring twice in the Royals' 5-1 win over Burton Albion. 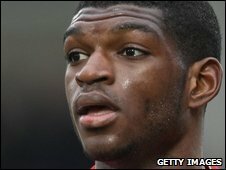 He spent time on loan in League One with Northampton and Cheltenham last season, scoring once for both clubs.